This feature is not available in .NET Core based installation. Using Report-View you can instantly monitor performance but you can also log these counters in a CSV file. All the counter values, which are currently in dashboard will be logged into a .CSV file after each second. You can start the performance counters logging instantly or you can schedule the logging on a specific time. Go to the Report-View Dashboard (built-in Report-View dashboard or your created dashboard). Click on the Start Logging button icon existing on the report view control. This starts the logging. Log file can be found under %NCHOME%/log-files/NCacheMonitor. 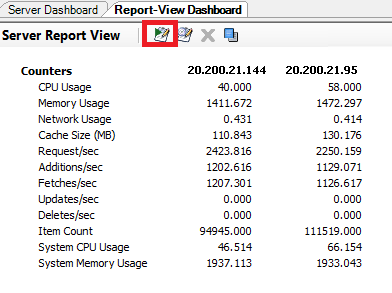 You can stop the performance counter logging by clicking on the Stop Logging icon in the Report-View Dashboard. Rather than manually starting and stopping logging you can also schedule logging. This way you can obtain logging data for a particular period of time. Click on the Schedule Logging icon in Report-View dashboard. Schedule Logging dialog box appears. Check the Log counters at the following schedule check box and configure the Start Time and Stop Time. Click OK. Logging will start at the specified time automatically. Schedule logging only works if NCache Monitor is started during specified schedule time.